DevOps (a clipped compound of “software DEVelopment” and “information technology OPerationS”) is a term used to refer to a set of practices that emphasize the collaboration and communication of both software developers and information technology (IT) professionals while automating the process of software delivery and infrastructure changes. It aims at establishing a culture and environment, where building, testing, and releasing software can happen rapidly, frequently, and more reliably. Our Faculty covers various aspects of DevOps during this training such as Continuous Integration, Continuous Delivery, Demo of a CI/CD chain using Jenkins, Selenium, Cucumber, Docker etc and makes the class a right combination of theory and practicals. DevOps Training in Mumbai is conducted by our faculty Archana Shinde. Archana has 15+ years of experience in IT field and has conducted more than 50 training workshops. Our DevOps Training in Mumbai focuses on learning rather than just a certification. Archana conducts various exercises, conducts games and makes the class very interesting. We conduct DevOps Training in Mumbai at Unit 220, Lodha Supremus II, Wagle Estate, Thane, 400604. 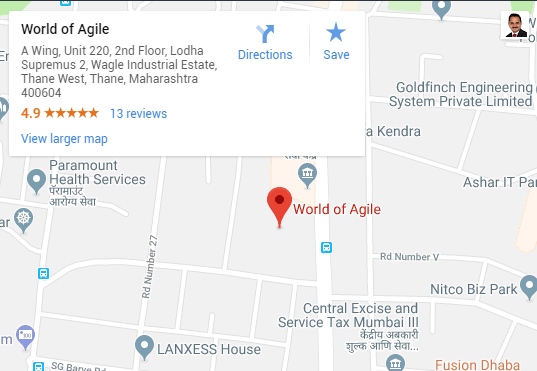 Search for “World of Agile” in Google Maps to locate the location. Or click on this link. Our students are our best ambassadors, so, hear and read from our own students on what they say about our training. Here is a feedback video from one of the Agile workshops conducted at Thane in January 2018.